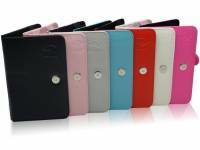 Our protective Book Case is made of high quality PU Leather. The beautifull case has a sleek design. Value for Money accessory for the Kruidvat Mobility m728 proline.